Never, in my wildest dreams or imagination, would have thought my photo would be selected as an Editor's Choice on the popular site 500px. Since receiving this honor, this photo has received the craziest amount of views, likes, and favorites! This obviously means nothing in the real world (unless someone important with some cash and an opportunity for me has now seen it). It doesn't mean I'm a better photographer than anyone else, nor do I claim to be, but this is the closest any of my art has ever been to going "viral". So I'm a little excited about it, and thought I might take this chance to explain how I created the amazing photo. The photo "Tobacco Barn" as I titled it on 500px.com (link to photo), was shot while I was on vacation with my lovely girlfriend Chloe in Kentucky. We were visiting her family, and after almost 5 days of being there I hadn't taken any photos! I was angry with myself for wasting the opportunity, since Kentucky's scenery is extremely different than Arizona. So with an hour until sunset, and 45 minutes before dinner was ready, Chloe and I hopped into the car and went to explore the countryside. 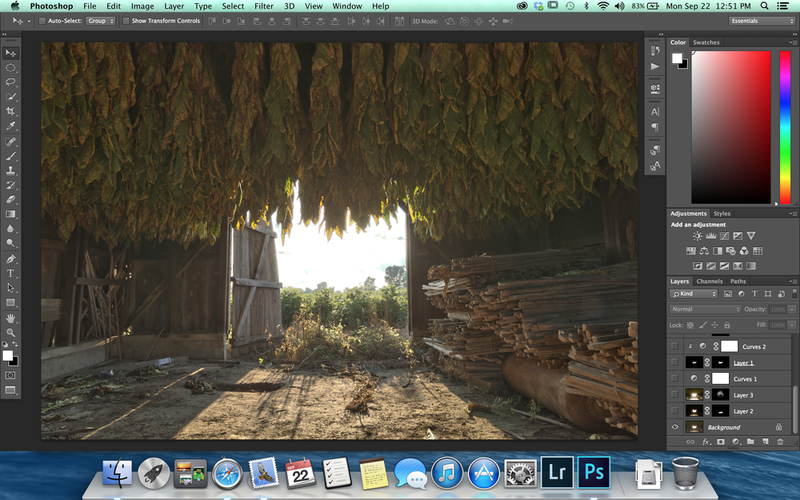 We found this amazing barn with hanging tobacco in it. This is a common sight this time of year in Kentucky, but there was just something different about this barn. The doors were half broken, it was covered in poison ivy, and just looked run down. On top of that, there was a magnificent light shining through the cracks and into the barn. All I can say is thank you magic hour :) . Now, here's how this shot was made. After perusing around the external part of the barn, I decided the best photo would come from the inside. I wanted my viewer to feel as if they were in the barn with me. I believe a feeling of immersion was achieved. As you can imagine, it was nice and bright outside, and dark inside the barn, which meant I had to combine multiple exposures. 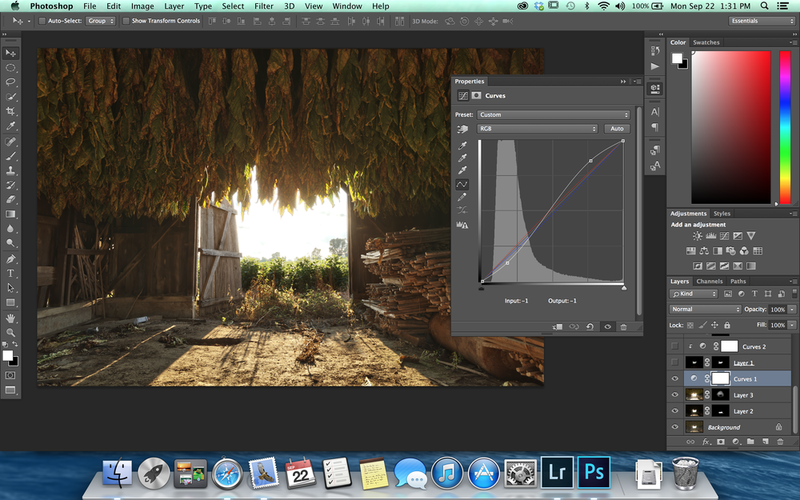 So technically yes this is an HDR image. I hate that look of over HDR that we so commonly see, so I made sure the post processing was very close to what was in the scene. I selected 6 different exposures in Lightroom and right clicking, told them to "merge to HDR pro in Photoshop"
From here we're brought into Photoshop and prompted with the controls of the HDR image. The whole point of doing this was just to give me a starting point. Things still looked way too HDR like for me. There was not a ton of contrast, and there were a few bits of ghosting that still needed to be taken care of. So, from here I went back into Lightroom and looked through the different exposures I had used to find parts that I liked better before they were combined into HDR. I then imported them into the photoshop file I was working on, and masked in only the parts I needed. First being taking care of the ghosting in the corn stalks in center of the frame, and making them darker because there was a darker shadow on the side not facing the sun in real life, and I wanted to portray that. After that was taken care of I wanted to bring in a bit of a glow from the outside that I really liked in real life. It was illuminating the center of the scene and parts of the hanging tobacco. This would also later help blend together the different masked in areas so there wouldn't be any hard transitions from shadow to highlight in the sky to the barn. Next I introduced a bit of color grading and contrast to the file. I know it's a bit out of order from what should have been done, but it's my weird process of doing things. Next I needed to bring in the sky, since there were amazing clouds. The problem was, it didn't blend well with the scene because the exposure was too dark. So I had to create a clipping mask with a curves layer to brighten it up to better match the scene, as well as color tone the sky individually. You can create a clipping mask in photoshop by holding down the [option] button on a Mac and clicking in between the 2 layers. Or right click on the layer you're clipping and select create clipping mask. 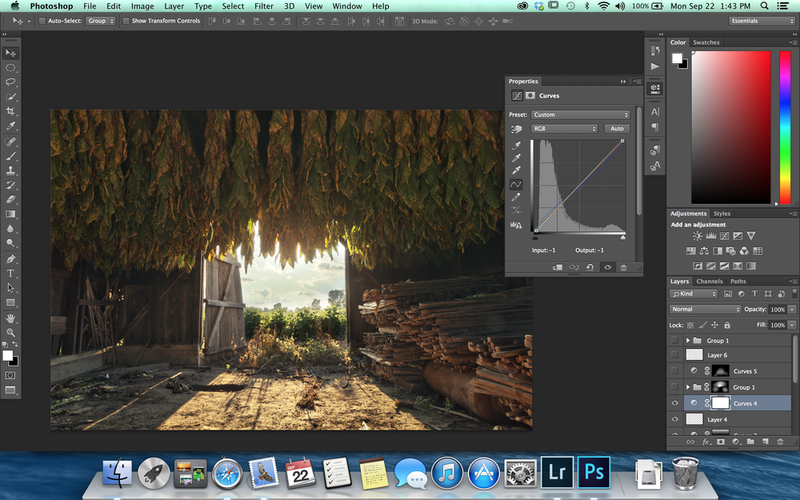 Next I added a small gradient to the top of the image brightening up where the tobacco is. Then I clone stamped out a bottle of what I think was rubbing alcohol from the left corner. Now, the image was looking pretty good. 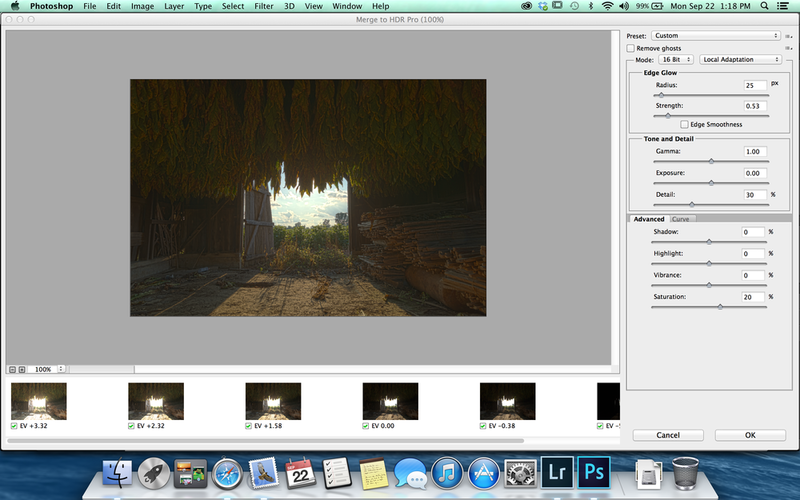 But it was a bit too warm for me in the shadows, and I wanted a little more cinematic color grading to the image. So I added another curves adjustment layer where I put more cyan in the shadows, reds in the highlights, and blues in the shadows in yellows in the highlights. I didn't touch the greens. Initially, I thought I was done with the image at this point so I went ahead and sharpened a few areas where I wanted the attention to be drawn to. It's not too noticeable, but it's important to give your viewer the subconscious knowledge of a sharper area of focus, if that makes sense. Fortunately I took a break and ate some dinner. When I came back to the image I knew it wasn't perfect. The sky was too dark still and it needed more of a glow coming across the tops of the corn and into the barn. So in an after thought I added another curves adjustment layer, where I brightened the mid tones, and added some reds and yellows into the mid tones as well. To give a bit of a warm glow coming across the corn and into the barn. This to me finished the image perfectly. And then another afterthought. I had to clean up any distractions like the bright leaf in the very front of the image as well as some small things in the dirt. I cloned those out, and I was done. I now had an image I was in love with. The following day I uploaded it to 500px. It got some good attention at first, but I would have never guessed, 15 days later it would be put on the top of the Editors' Choice for landscapes. In the 5 days that it's been on there, it has gotten ~ 35,000 views / over 800 likes, and few shy of 400 favorites. On top of that, I had only 10 followers on 500px after being on the site for almost 2-3 years. Now I'm almost at 3000 followers.... This is mind blowing to me. But, like I stated at the beginning of this post, that means nothing to me. Yes, it is a HUGE honor, and I'm very grateful for this to have happened, but it doesn't make me a better photographer, or person for that matter. The only thing that is really great about it, is now there's way more of a chance that someone might have come across my work who can offer me a PAID opportunity to do something like this again. Thank you for going through this post, seeing how this cool image was created, and I hope you learned something that will help you in your career as well. Gear used was - Canon 6D w/ Canon 24-105mm f/4 lens and a manfrotto tripod and ball head. And come follow the rest of my work on 500px, Instagram, Twitter, Facebook.